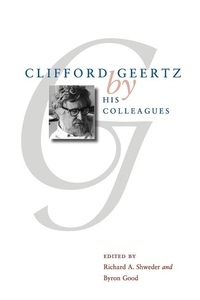 Clifford Geertz is the most influential American anthropologist of the past four decades. His writings have defined and given character to the intellectual agenda of a meaning-centered, nonreductive interpretive social science and have provoked much excitement and debate about the nature of human understanding. As part of the American Anthropological Association's centennial celebration, the executive board sponsored a presidential session honoring Geertz. Clifford Geertz by His Colleagues compiles the twelve speeches given then by a distinguished panel of social scientists along with a concluding piece by Geertz in which he responds to each speaker and reflects on his own career. These edited speeches cover a broad range of topics, including Geertz's views on morality, cultural critique, interpretivism, time and change, Islam, and violence. A fitting tribute to one of the great thinkers of our age, this collection will be enjoyed by anthropologists as well as students of psychology, history, and philosophy.